the lunar phase is mirrored. The planet's equator faces directly toward the host star causing nearly equal amounts of day and night throughout the world. From this point on the days will be getting longer in Borealis and get shorter in Australis. The Passerids are an average shower, usually producing about 20 meteors per hour at their peak. These meteors can produce bright dust trails that last for several seconds. The shower usually peaks on Anura 2 & 3, although some meteors can be visible from Caniformia 28 - Anura 6. Look for meteors radiating from the constellation of Passer(Sparrow) under the right wing of Ardea, after midnight, and be sure to find a dark viewing location far from city lights. Look for meteors radiating from the constellation of Passeris after midnight. The Capitis Tandornids are a light shower, usually producing about 10 meteors per hour at their peak. The shower's peak usually occurs on Anura 16, 15 however viewing should be good on any morning from Anura 15 - 18. The radiant point for this shower will be at the head of the constellation Tandornin. Best viewing is usually to the east after midnight, far from city lights. This shower annually falls on Transequinox (Transition to Equinox) in the northern hemisphere, and Transnox (Transition to Winter Solstice) in the southern hemisphere (Anura 15th). The Borealis Polus (North Pole) of the earth will be tilted toward the Sun. This day has the longest amount of daylight of the year (Lux) in Borealis and the longest night of the year (Nox) in Australis. The Ciconii Tandornids can produce about 20 meteors per hour at their peak. The shower usually peaks on Ciconii 7 & 8, but some meteors can also be seen from Reptilia 28 - Ciconii 28. The radiant point for this shower will be in the constellation Tandornin. Best viewing is usually to the east after midnight. The Ciconii Cervids is one of the best meteor showers to observe, producing up to 60 meteors per hour at their peak. The shower's peak usually occurs on Ciconii 22 & 23, but you may be able to see some meteors any time from Ciconii 2 - Aquatimal 1. The radiant point for this shower will be in the constellation Cervid. Find a location far from city lights and look to the northeast after midnight. The planet's equator faces directly toward the host star causing nearly equal amounts of day and night throughout the world. From this point on the days will be getting shorter in Borealis, and longer in Australis. The Tetraonids is an average shower producing about 20 meteors per hour at their peak. This shower usually peaks on Anatidae 30, but it is highly irregular. A good show could be experienced on any morning from Anatidae 29 - Artiodactyla 3, and some meteors may be seen any time from Anatidae 26 - Artiodactyla 4. Best viewing will be to the east after midnight. Be sure to find a dark location far from city lights. The Pteromyinids is one of the better meteor showers to observe, producing an average of 40 meteors per hour at their peak. The shower itself has a cyclic peak year every 33 years where hundreds of meteors can be seen each hour. The last of these occurred in 19 B.E. (2001 C.E.). The shower usually peaks on Artiodactyla 27, 28 but you may see some meteors from Artiodactyla 23 - 30. Look for the shower radiating below the constellation Pteromyini after midnight. Considered by many to be the best meteor shower in the sky, the Lynxids are known for producing up to 60 multicolored meteors per hour at their peak. The peak of the shower usually occurs around Humiaves 23, 24 , although some meteors should be visible from Humiaves 16 - 29. The radiant point for this shower will be at the back of the constellation Lynx. Best viewing is usually to the east after midnight from a dark location. 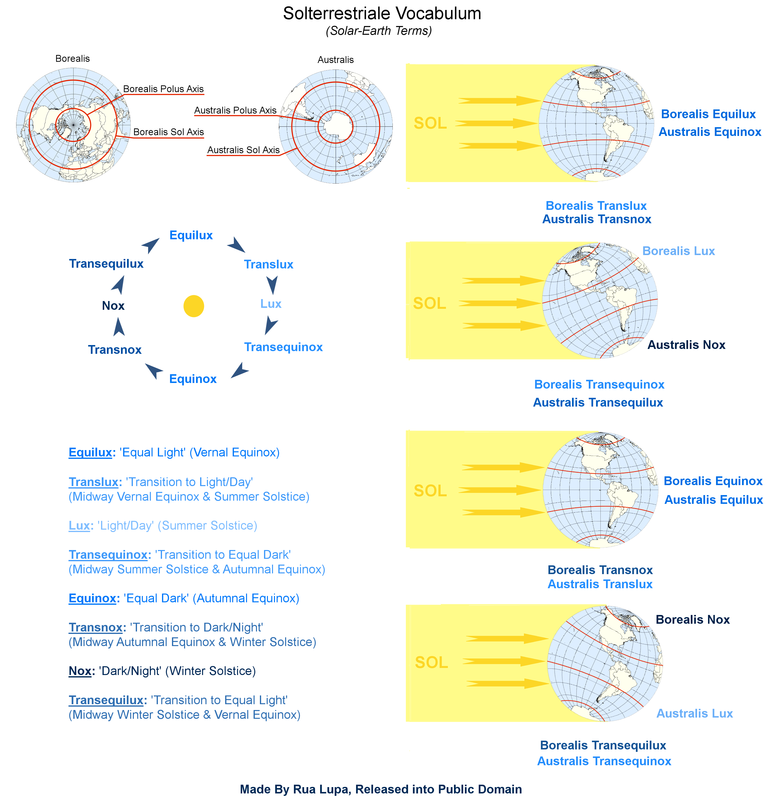 The Australis Polus (South Pole) of the earth will be tilted toward the Sun. This is the longest night of the year (Nox) in Borealis and the longest day of the year (Lux) in Australis. Pecora 14, 15 (Jan 3,4) - Coaxo Ranids Meteor Shower (Quadrantids Meteor Shower). The Coaxo Ranids are an above average shower, with up to 40 meteors per hour at their peak. The shower usually peaks on Pecora 14, 15 but some meteors can be visible from Pecora 12-16. Best viewing will be from a dark location after midnight. Look for meteors radiating from in front of the head of the constellation Rana, hence the name Coaxo Ranids (Frog Croak).